When you are writing your thesis ensuring that your text is free from any mistakes can be crucial in helping you to attain higher marks. Using the spell checker functionality can help, however it is far from perfect and can often omit certain basic errors. This is why proofreading your thesis thoroughly after you have finished editing it is so important as well as asking others to proofread it too if possible. Below you will find useful tips and techniques to help your proofreading sessions be more efficient and effective. When proofreading it is important to remember that your sole aim is to spot mistakes and not to simply read over your work. Being in the correct state of mind is extremely important, as if you are distracted you will be unlikely to spot every mistake. Switching mobile phones off, avoiding social networking or anything that could distract you will give you the best possible chance to spot each and every possible error. Often reading on a screen can be different to reading on paper, so printing out a copy to proofread can help you catch errors you may have otherwise have missed. Also reading aloud will also help you to hear errors you may not have seen whilst reading. Homonyms are essentially words that share the same spelling or pronunciation, however have a different meaning. Common examples of this are using ‘accept’ with ‘except’ or ‘complement’ with ‘compliment’ these are often used interchangeably and incorrectly. These are common errors, therefore being aware of this will help you to spot them, many people often mix ‘their’ and ‘they’re’, ‘its’ and ‘it’s’, ‘your’ and ‘you’re’ and so on. Also with regards to the apostrophe remember it is never used to form plurals. Focusing on the words and phrases used is important, however do not neglect the punctuation. Pay close attention to capitalised words and whether places or names which should be capitalised have not been capitalised, also look out for missing or extra commas, the use of full stops and so on. During the writing process as you would have been reading and going over the work constantly, it is common to become blind to your own mistakes, as the brain starts to automatically “correct” wrong words inside sentences. A good technique to break this pattern is to read the text backwards, word by word. After proofreading your work thoroughly taking into account all of the above points, it would still be recommended that you ask someone else to have a look. You will be surprised at the mistakes that you may have missed. Also a second person proofreading will also be in a stronger position to evaluate whether the sentences make sense or not. 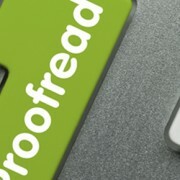 At Proof Right we offer a professional thesis proofreading service. We are able to ensure that your work is not only free from spelling mistakes and grammatical errors but we also check syntax, sentence structure and are able to recommend improvements and suggestions that are relevant to your work. We will also check that your tables and footnotes are accurate and consistent with your bibliography.